Today was a day I'd been looking forward to for some time! We were off to Mt. Osore which is considered to be the entrance to the Buddhist Hell and literally means fear mountain. 恐山 = Osore-Zan =Fear + Mountain. Mount Osore is located on the Shimokita Peninsula and is about 100km away from Aomori. Public transportation is infrequent and a bit slow taking around 3 hours to get there. The best train from Aomori that had the most convenient transfers left at 7:10am. Breakfast was free at the Toyoko Inn but wasn't served until 7:00am, so we had to skip it unfortunately. We got both breakfast and lunch to take with us at a New Days convenience store located in Aomori station. New Days is like a train station convenience store as they seem to be exclusively located within the stations. I think that there was at least one in every medium or larger sized station. I wonder if they have some sort of deal with JR? Although we were using our rail pass the train we were getting was not actually a JR line! It belongs to Aomori Railways and leaves from a separate station that is attached to the main JR station. The train had a cute picture of a blue tree on it which is Aomori Railway's logo. The reason the tree is blue is because Aomori literally means blue forest (青森 ＝　blue + forest). Kinda. The Japanese language has a bit of a funny relationship with the kanji and word for "blue" as it can also refer to things that are "green". In fact to say that a traffic light is green you actually say it's blue (青信号 = aoshingou = blue traffic light). Although people understand that you mean green. This happens with some plants and vegetables as well. This is due to the fact that seperate words for colours only emerge once a culture has made a distinction between them. For the main colours, first white/black are recognized, then red which is followed by green/yellow and finally blue. Once these colors are described then brown, purple, pink, orange and grey are also recognised. There is a word and a kanji for green. It's "midori" ( 緑 ). However, this kanji appeared only around 1000 years ago and for a long time was still considered to be a shade of Ao (青). In fact, Midori and Ao were only taught as distinct colours after WW2. I wonder if there's any colours that we as a culture haven't yet distinguished? Violet and indigo both just look purple to me even if they have got separate words. Maybe that's just me. Anyway- you have Aomori with its blue trees. We didn't have to buy a ticket as there's a special rule that lets you use Aomori railways with the JR pass for free as long as you get on and off at either Aomori, Nogeji, or Hachinohe stations. This is to allow access to the JR Ōminato Line which is the only JR line completely isolated from the JR rail network. The JR Ōminato line used to be joined but was cut off in 2010 when the the connecting Tōhoku main line was transferred to Aomori railways with the extension of the Tōhoku shinkansen to Aomori. Next to us on the train were some teenage boys who looked like they were going to participate in some sporting event. I overheard one of them say to the other "I wonder where they're going" and the other one guessed correctly saying "Osorezan probably". I didn't confirm this or say anything to them. The train spent most of the time traveling along the ocean which was sparklingly a really beautiful blue as it was a wonderfully clear day! Once we got to Noheji we transferred to the Ōminato line. We didn't have to show our ticket at any point along the Aomori Railways journey (even at Aomori station) and did not have to show it to transfer either. 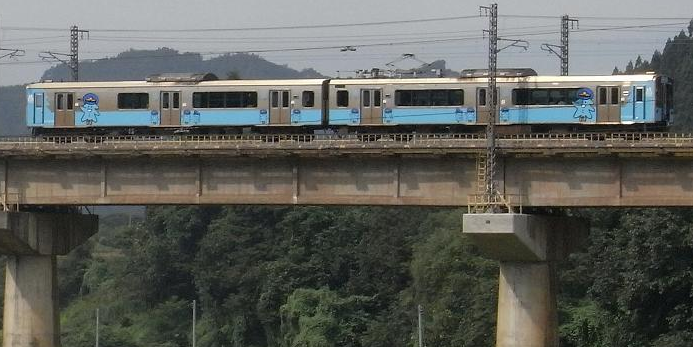 The Ōminato line train (KiHa 100) was smaller than the previous one with only two carriages and was a "One man" (ワンマン) train which meant it only had a driver and no conductor. Osorezan is located on the Shimokita Peninsula (下北半島 below + north + half + island) which is an axe shaped piece of land located at the most northern part of Honshu. It's quite remote for japan with a practically uninhabited mountainous interior with a few villages along the coast and is known for it's harsh winter weather. From Noheji we will be making our way up the western side of the "Axe" until we get to the town of Mutsu (むつ). From there we will catch a bus into the blade where Osorezan is located. We sat near the front and we could see the train winding its way through the trees and occasional buildings. The ocean views were even more pretty and it was very hard to study my anki cards with the amazing scenery. Along the way we went really close to some massive wind turbines! I also saw a gravestone shop along the way- Japanese style headstones with prices. The train would occasionally blast its horn when there was cars or trucks on the tracks ahead of us- it was incredibly loud and gave me a massive fright every time. I'm glad we didn't hit anyone. Once we got to our destination and the penultimate stop on the line we hopped off the train and went to look for our bus. There was one there and it had "恐山" (Osorezan) displayed on the front. There was no bus driver there yet and we both really needed to go to toilet. We were a bit worried the driver would suddenly turn up and it would leave without us but there were toilets nearby and we made it! The bus spent some time driving around town and some people got on and off- they were just using it as a local bus. Once we started going up the mountain there was pre-recorded information over the bus speaker (in Japanese talking about the area and Mt. Osore. When the bus wasn't talking it was playing some religious sounding music. A man in front of us on the bus started talking to us in English. He said he went to Australia for business a few months ago (Melbourne). This happened quite a few times on our trip and a lot of people said they went to Melbourne! About halfway up we stopped at a roadside spring where water was coming out the side of a hill. There were bottles and apparently if you drank the water you'll live longer. The man who spoke to us said that if you drank it you'd live until you died. Everyone got out and had a look (about 6 people) and one of the old ladies drank some. After that we hopped back on the bus and "恐山" popped up as the next destination. The man that spoke to us in English was surprised when I read out the destination to Kate. Although we both agreed that it's not that strange to recognize the kanji for the final destination even if you didn't know Japanese. Once we arrived we got off last and tried to use the welcome pass but the driver didn't accept it! He tried reading it but there wasn't any specific instructions about Mutsu bus. We just shrugged and paid the full fare. I swear that it was on the Northern Tohoku Welcome Card website. When I went to verify this though I couldn't find it. It was the whole reason we made the cards. Maybe I'm just crazy? It was 9:45am and we had finally arrived! The next bus came at 10:00am (actually just the bus we arrived on going back to Mutsu) which was way too early. Since the bus after that left at 1:00pm, we had a fair bit of time to explore the area (3.25 hours). There were not too many people around and we were having a bit of a look at the scenery outside the temple when suddenly a tour bus arrived and heaps of people spilled out! We quickly made our way to the temple and managed to get in before them. They must have been on a tight schedule though as the all overtook us and disappeared relatively quickly. The temple is known as Bodai temple and was first established in 862 CE by a Buddhist monk and is associated with death and the afterlife. We had a brief look at the temple buildings which were pretty impressive in their own right. There was also some communal baths although we didn't try them- our main area of interest was the geothermal activity near the lake. The area is surrounded by a number of hills and has a lake at the center. The whole area is shaped like an upside down dome as it's actually a volcanic caldera that formed during a major eruption of Mt. Osore. Caldera's are bowl shaped depressions formed when an eruption expels so much magma (as lava) that a void is formed, causing the overlying land to collapse into it. The hills are the rim and the lake formed when rain water partially filled it up. When this rain water percolates down to the hot rocks below it heats up, turns to steam, and eventually makes it way back up to the surface by traveling through cracks in the rocks (if there are no crack the stream will make some). The temple is built around a large number of these cracks where stream and hot water are escaping giving the area a hellish appearance. The water has different minerals dissolved in it which precipitate out at the surface causing colorful streaks and changes in the water colour. We initially went up a steep path that looked like it turned into a longish walk and while we were interested in continuing up it we returned back down as we wanted to explore the bubbling rocks and lake first. Almost all the areas where steam was bubbling up, as well as many other areas had rocks stacked up into a cone shaped pile. This is done by people and I think it's an attempt to help souls cross the nearby river. 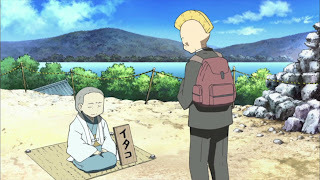 Osorezan was featured on the 5th episode of Nichijou! One of the characters (Tsuyoshi Nakanojō) spends 8 hours travelling to Osorezan in order to debunk the existence of mediums and the supernatural. Nakanojō has a Mohawk as his hair does not grow on the sides and is quite skeptical and attempts to debunk the supernatural on several occasions. His attempts are shown in a positive light with the purveyors as obvious fakes. However, this is world that has such things as a talking cat, explosions that hurt no one, and an 8 year old professor who made a completely realistic looking robot girl who can shoot beans and fish cake out of her arms (much to her dismay). Apart from these absurdities the characters lead normal lives. Nichijou is a hilarious 'slice of life' comedy and is highly recommended. During Nakanojō's visit, the medium (Itako) did an extremely unconvincing channeling of "soup" and the mystical illusion was shattered when he noticed she had Mcdonalds, an mp3 player and a Digimon. We didn't look for the exact locations but you can see that it's pretty realistically portrayed. While we did not encounter any mediums we did see a lot of stink bugs! There were thousands and thousands of them being swept out of the toilets that were located among the rock mounds and bubbling water. One of the sweepers said "Japanezu stink mushi" to us. Mushi means bug. Other things we looked at include a large statue and a number of largish pools that were strangely coloured due to their mineral content. It was quite fun walking around and looking at everything in the area. We took a lot of photos and a few videos too! Once we arrived at the main lake we stopped under a gazebo and had a snack. While we were eating we saw a 20ish year old man put his camera up on a ledge, set the timer and run down to the lake. He shot us an embarrassed glance and flashed the peace symbol as the camera took the photo. After our snack we walked along the lake a little and ended up following a path that looked to lead to the front of the temple. We thought we could follow it all the way back but the path suddenly became completely overgrown so we had to double back. On the way back we looked at a few of the things that we missed and realised that 2 hours had completely flew by! Since we still wanted to go back out of the temple and look at an old red bridge located down the road a little we could not go on the walk we considered earlier. On the other side of the temple there some stairs leading up a hill. When we climbed up we saw a building about half way up that looked like it was harvesting hot water. There was a quite a good view of the whole area from the top. After climbing back down we had one last look at the temple buildings before exiting the temple complex. There were some vending machines outside and one of them had sugar free 7-Up! Apart from cola flavors (which contain caffeine) diet drinks are quite rare in japan unfortunately. I guess people just drink tea if the want a low calorie option as there's heaps of tea available. Sadly the 7-up was full of caffeine anyway! Kate got some and I ended up getting some delicious sugary strawberry milk instead. We drunk our drinks while we walked along the lake and road towards the iconic red bridge. This bridge crosses the river Sanzu which is comparable to the river Stynx of Greek mythology in that souls have to cross it after death in order to reach the afterlife. In Buddhist mythology how easily you're able to cross is dependent on how good a life you lead. I managed to cross over pretty easily thanks to the red bridge built over the river. We had a look at the lake and water and at this point I'd like to point out that information from multiple sources claimed that this water in this lake is far too poisonous/acidic to support any life. From the bridge we could see clearly see many fish swimming around quite happily in the water! Unless these fish are super powered mutant fish or something- we were lied to! "Chuui" means "Caution" and since "mushi" means "bug" I thought it was referring to some sort of bug- perhaps the stink bugs? On our way back I looked "Mamushi" up on my phone and it turns out that it means "Pit Viper"! Which is a venomous snake. Shows how a little knowledge can be dangerous. After the bridge we walked back to the bus stop and had the remainder of our lunch. One last thing I haven't mentioned yet is that the sky overhead was absolutely full of contrails! They were everywhere and I'd never seen anything like it. I suspected that we were probably under the Tokyo-Sapporo flight path. This would account for the myriad contrails as this route is the busiest in the world with around 80 flights making the 1.5 hour journey every day. Also one of the hills had a big box shaped building on top of it that looked like a washing machine. Not sure what it was but it may have been Mt. Kamafuse Observatory? Although it looked much more square than that building. We had the same bus driver on the way back so we didn't try and use the pass again. We had a longer wait (about 25 mins) at Mutsu for the next train to Noheji so we had a look in a souvenir shop across the road and went for a little walk down the road. Once we got back to Aomori we went and had a look at the Wa Rasse Nebuta House which is a newly built big red building across the road from our hotel. The building houses the Nebuta float museum which recreates the Aomori Nebuta festival which is one of the biggest festivals in japan and attracts millions of people every year. The museum was really well done and the floats were extremely colourful and fun to look at. There was also a place where you could design your own warrior face using an interactive computer terminal and have it projected onto a big blank mask on the wall. You could go right up to the floats and take photos and there were sections that you could touch as well to feel the fabric. On the way out Kate bought some apple flavored lollies from the souvenir shop. After the float museum we went down to the Aspam Center which is a weird triangle shaped building that acts as the tourism center for the whole of the Aomori prefecture. We paid a small fee to go to the top where there were nice views of of the area. We received a card that gave us a free drink at the vending machines at the top. I got a green melon flavored drink. It was sunset when we got up there and the views were really pretty! We could see over the ocean, the bridge, the city, and the mountains. At the bottom there were souvenir shops where Kate got some postcards and a key-chain featuring the cute blue tree from Aomori Railways. We asked about buying a stamp and were told to go to the information desk where we could buy one. There was someone there but since it was after 5pm they could no longer sell us a stamp! Seemed a bit strange. Behind the Apasm Center there was a small triangular building that seemed to have a maritime theme but there was no one in it and it wasn't very good. We had a nice walk along the water and under the bridge on our way back to the hotel and decided to have dinner at Otoya again! We both had the same meal again and it was just as delicious as the night before! We noticed that some Chinese people were having difficulties ordering and learnt something we'd been wondering for a while. How do non-English/Japanese speaking people get by in Japan? Turns out that if both people know a little English they can use that- even if neither of them can fully speak it. After dinner we got some more calorie free jelly and went to check out a bowling alley we saw from the Apasm center. It had a giant bowling pin on it. We thought we might be able to have one or two games but when we went in we found that it was a bit run down. There were some dodgy UFO machines and the place smelt of cigarettes. When we found the bowling section we saw that it was absolutely packed of business men in suits! There were no girls or people just casually bowling. It looked like they came straight after work. So we just went back to the hotel. Tomorrow we'll be off under the ocean to Hakodate!